Noah Webster’s ca. 1750 house is available to visitors on a walk-in basis seven days a week from 1-4 p.m. Guests may self-guide through the house using our new tablet tour. Docent-guided tours are subject to availability and last approximately 45 to 60 minutes. Tablet tours allow visitors to take a tour at their own pace. 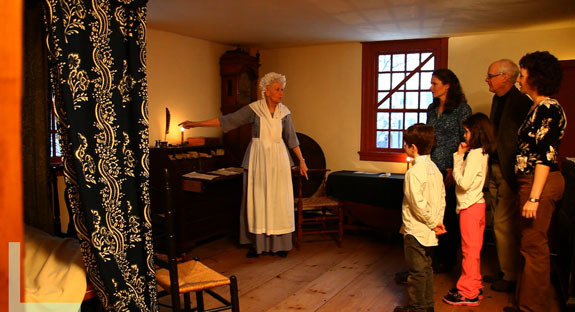 Noah Webster’s house consists of four period-furnished rooms in two floors. We do our best to accommodate everyone. The second story of the historic house is not handicapped accessible, but a visitor may use a tablet to learn about the second floor. In addition, the tablet tour offers closed captioning for the deaf and hard of hearing, as well as a Spanish translation. Seating during the tour is available upon request. We also offer hands-on opportunities for those with low vision or blindness. Please let our host/hostess know if you need special accommodations. Private tours are available at various hours by scheduling in advance. Please see Adult & Family Programs or School & Youth Programs for more information.